The Draft is the NFL's party, but the special guests, the draftees, all are just one foot off an NCAA football field. When it comes to the pros, Philadelphia is sports crazy no matter what the season or sport, although football does get the green light on the radio all year long. However, it's no question that Philly is a hoops town when it comes to college. NCAA basketball runs deep. Despite that, our hometown football programs received some well deserved representation in the first two rounds of the draft on Thursday and Friday night. The resurgent Temple program garnered two picks and perennial FCS powerhouse Villanova also sent a pick to the stage. LB Haason Reddick of Temple was selected #13 overall in the First Round by the Arizona Cardinals. Reddick is 6' 2", 237 lbs from Camden, NJ. 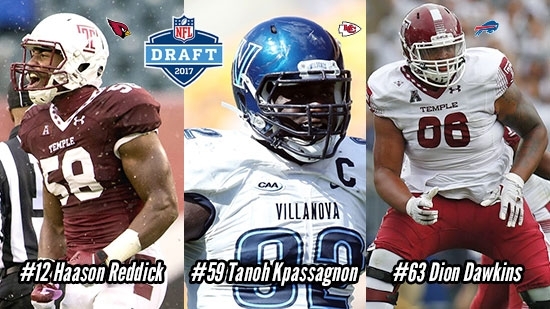 DE Tanoh Kpassagnon of Villanova was selected #59 overall in the Second Round by the Kansas City Chiefs. Kpassagnon is 6' 7", 289 lbs from Ambler, PA.
OG Dion Dawkins of Temple was selected #63 overall in the Second Round by the Buffalo Bills. Dawkins is 6' 5", 320 lbs from Rahway, NJ. *WR Chris Goodwin of Penn State was selected #84 overall in the Third Round by the Tampa Bay Buccaneers. Goodwin is 6' 1", 205 lbs. from Middletown, DE.